A threat against the Three Mile Island nuclear plant prompted two nearby airports to close for four hours, until the threat was discredited, a federal official said Thursday. The plant remained on high alert, though the reactor was shut down earlier this month for maintenance. Military aircraft patrolled area skies and the FBI and state police watched over the plant, site of the nation's worst commercial nuclear accident. "It was a real threat, and we handle it the same way as if (the reactor) was up and running," said Maria Smith, a spokeswoman for the Pennsylvania Emergency Management Agency. Authorities said the threat came Wednesday night but released no other details. Melanie White, spokeswoman for the Nuclear Energy Institute, said the Three Mile Island plant "is implementing safety standards" as governed by the Nuclear Regulatory Commission. She added, "Everything appears back to normal." A spokesman for Exelon, the owner of Three Mile Island, said earlier Thursday that a "credible threat" had been made against the power plant. Nearby Harrisburg International Airport and Lancaster airport were shut for four hours until about 1 a.m. Thursday because of the threat. Local television stations said temporary flight restrictions were put into effect for a 20-mile radius around the airport and military aircraft were dispatched to protect the plant. Officials had no timetable to lift the additional security at Three Mile Island. Security had already been increased since Sept. 11 and was heightened again after Wednesday's threat. Three Mile Island was the only nuclear power plant threatened, plant spokesman Ralph DeSantis said. 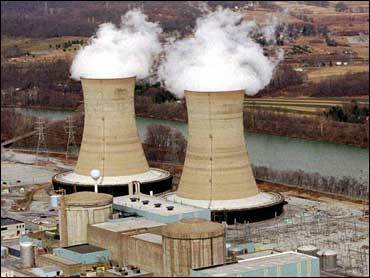 Three Mile Island is located just outside Harrisburg. In 1979, the plant was the site of America's worst commercial nuclear accident when about a third of the nuclear fuel melted inside a reactor and radiation leaked into the atmosphere.